How would you explain this to your Mom? Writing for your audience instead of yourself. April 9, 2012 by C.S. Clarke, Ph.D.
One of the hardest things about writing in a field where you’re an expert is that you want to explain too much. You want to compact everything you know about the topic into each article. I had an English teacher in high school who called it “diarrhea of the pen,” because you always end up writing too much. But I think of it as “constipation of the mind,” because before you write too much about it, you are stuck in a mind crammed with all this stuff. Stuff that you know relates. Stuff that you know helps. Stuff that you know can’t be delivered in a nutshell. And you’re not sure how much is enough. Then you start writing. And writing. Suddenly you have a thousand word article where you intended four hundred words. The whole idea of writing articles and blog posts is to give your audience the information and ideas it is looking for. And you already know how to do that. You learned that when you wrote essay exams in school. You knew what the teacher was looking for and you gave him or her the essence of it in a paragraph or three. You covered the main points and then went on to the next question. You didn’t have time to fool around. You just got right down to it. You also know how to give targeted information and ideas from having to explain things to friends and family. You don’t give them a dissertation. You give them a casual overview of what they’ve asked about. And maybe you throw in a story or two to illustrate. Maybe you refer them to a YouTube video you’ve seen that shows them more. Or email them an article you’ve read that covers the material in more detail. Or take a photo of something that sheds more light on it. Or refer them to an amusing infographic. November 27, 2013 March 29, 2012 by C.S. Clarke, Ph.D.
Do you have to read a lot and take notes? Maybe you’re writing a book, e-book or article. Maybe you’re a student. Maybe you’re a lawyer or some other professional doing research. Whatever the reason, I have a quick system and some productivity tools for you that will make the process easier, faster and more pleasant. They might even make it fun. In this post, I’m going to tell you about the system and give you some free tools to download and implement it. They’ll not only bookmark the reference, they’ll also give you a place to jot notes, ideas, summaries, analyses and more. While they’re in the book or other publication, they look just like tabs; which helps you find your references faster. 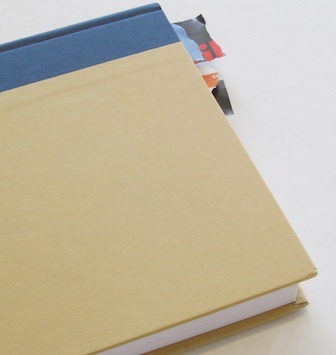 And when you’ve finished reading the publication, you’ll have a pack of structured notes. Or you can make copies and leave the originals in the book for future reference. When I was in college, I did — for a while — what most students and others who research do. I highlighted important passages, wrote in the margins and stuck torn-paper bookmarks in pages that were important. Then I could go back later and review, or write notes and references for term papers. Or copy ideas and passages into my notebooks to study for exams. The process was less than efficient. So I developed a better book, article and journal noting system. I made up some special notepapers from divided 8½ x 11 paper. 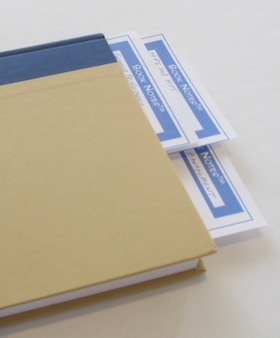 I called them Book Noters™ and Page Noters.™ I used them in place of bookmarks and eliminated any need to write in margins or take notes in notebooks. I just stuck them in the important pages and took notes directly on them. I noted the name of the book or article, the date and the page number. I still highlighted the important passages in books I owned, but my notes were now portable and well-organized. By the time I finished the book, I had a pack of notes I could clip together to study for an exam, write a review, write a term paper or whatever else I needed to do with the information. I didn’t realize then what a great tool I’d made for use in research and writing for professional uses of all sorts. But later, I not only used them for myself, I made copies for my students, when I was teaching, and for colleagues as well. After all, which would you rather have? An organized note taking system that can be structured and customized by topic.